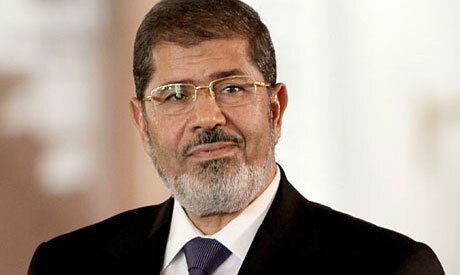 Egypt's President Mohamed Morsi, (Photo: AP). Egyptian President Mohamed Morsi said in a televised statement Thursday night that the rights of victims of violence that erupted in Port Said in January following a court verdict are guaranteed pending investigations. The handing down of death sentences to 21 local residents for their part in the killing of more than 70 Al-Ahly club fans in Egypt's worst football disaster in February 2012 sparked violent confrontations with security forces and incited calls for civil disobedience. “When the results of the investigations emerge, all rights of the families of anyone martyred in Port Said shall be preserved,” he asserted. President Morsi's statement came following a meeting with 3 families from Port Said earlier on Thursday whose kin died in the clashes. Morsi claimed in the statement that the families he met represent the people of Port Said. More than 50 people have been killed and hundreds more injured by the police in the aftermath of clashes against the court verdict issued in January. According to presidential sources quoted by Al-Ahram’s Arabic news website, Morsi said in his meeting with the families that victims who fell during the bloody events are to be given the status of 'martyrs of the revolution' allowing their families to be given compensation from the state. The status is only to be granted for non-convicts and after judicial investigations ascertain they did not engage in acts of sabotage or attacked the Port Said prison where the violence erupted on 26 and 27 January, said the source. Morsi also stressed on the reinstatement of the city’s duty-free zone, previously shut down by ousted president Hosni Mubarak in 2002, saying that as an MP at the time, he stood against the decision. On Saturday, a court confirmed the death sentences of those found guilty in the January hearing and sentenced 24 others to jail, provoking further protests from the Port Said residents, who complain of being scapegoated for the perpetrators of last year's disaster. Prior to the initial court verdict, Morsi issued a presidential decree mandating the inclusion of the Port Said football massacre victims in the official list of the revolution's martyred and injured.